Sometimes we forget to document one of the most important stories of all - capturing the story of US! Now you can celebrate the love of a lifetime with the softness of my Me and You collection. With it's delightful combo of feminine florals, gold foil, creamy lace, and bold geometrics, this on trend paper pack will have you pouring your heart out in no time! Plus, with the sweet sherbet color palette, it perfect for capturing so much more than Valentine's Day date nights. Use it to record the first time you and your partner exchanged I love you's, a magical proposal, a much-needed romantic getaway, or your family's love story! This gorgeous paper pack is just the thing for scrapping all your heartfelt memories! Perfect for layering on digi-pages, printed out for hybrid projects, or tucked inside your favorite pocket style album! Sometimes we forget to document one of the most important stories of all - capturing the story of us! Now you can celebrate the love of a lifetime with the softness of my Me and You: Paper pack. With it's delightful combo of feminine florals, gold foil, creamy lace, and bold geometrics, this on trend paper pack will have you pouring your heart out in no time! Plus, with the sweet sherbet color palette, it perfect for capturing so much more than Valentine's Day date nights. Use it to record the first time you and your partner exchanged I love you's, a magical proposal, a much-needed romantic getaway, or your family's love story! This gorgeous paper pack is just the thing for scrapping all your heartfelt memories! Perfect for layering on digi-pages, printed out for hybrid projects, or tucked inside your favorite pocket style album! PROMISE is an exciting word because it is so full of hope. It is so full of potential. We feel the hope and potential and joy and excitement of PROMISE at the beginning of new relationships and unions (marriages, beautiful couplings, summer love). We feel the power of PROMISE at the beginning of new journeys in our lives and at the start of new seasons. So, we've created this beautiful kit for all the ways that we embrace PROMISE in our lives. The kit contains: This kit contains: 26 - 3x4 journal cards, 6 - 4x6 journal cards, 4 - 4x4 journal cards, including many alternate colorways, 97 elements, 10 solid papers, 1 template and 1 alpha in 4 colorways. The Bloom papers coordinate beautifully with the complete Memory Pockets Monthly collection "Promise" for June 2016. The Bloom Paper collection includes 20 versatile papers (with several alternates) in springy, happy hues with touches of texture, floral and classic patterns. All products are created at 300 DPI for optimal printing quality. Please see my TOU for full terms. 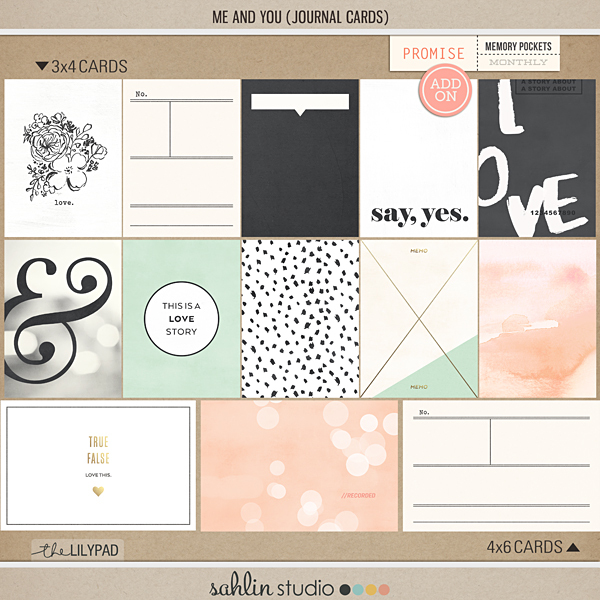 I hope you have fun scrapping your own stories with the Promise collection! Feel free to visit my blog: http://plantyourstory.com/ for more inspiration, story centric journal prompts, updates, goodies and news.